PESHAWAR: The Centre for Governance and Public Accountability (CGPA) welcomed the amendment to the Right to Information act to include the K-P Assembly, within its ambit, stated a handout issued on Monday. CGPA Executive Director Muhammad Anwar said the provincial assembly had exempted itself from the RTI ambit in June 2015, but he appreciated the provincial government for listening to the public's demand of greater transparency from the members of provincial assembly. "Now the public can inquire about the legislative performance and use of the budget by MPAs, thereby ensuring greater transparency and accountability in the ranks and files of the K-P government," he said. The information commission also suggested the Peshawar High Court be included as a 'public body' so that information can be demanded from it. The commission also suggested the provincial government be bound by law to appoint a new commissioner in case of a vacancy within 30 days. The executive director added as per the recommendations made by the commission, the law should determine the appellate forum for appeal against decisions of the information commission. The information commission suggested that the Peshawar High Court be made the appellate forum and not the district and sessions' courts. 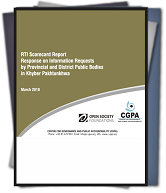 Furthermore, CGPA urged the provincial government and president of Pakistan to extend the RTI law to the Provincially Administered Tribal Areas (PATA) falling under the jurisdiction of Khyber-Pakhtunkhwa. The 33 members of the provincial assembly from PATA have participated in the enactment of the law, but it is not applicable in their constituencies. "Not extending this law to PATA is tantamount to a violation of the constitutional rights of PATA to access information as guaranteed by Article 19-A," Anwar said.